Upper gastrointestinal bleeding (UGIB) is a common condition with an incidence of 40 − 150 cases per 100 000 inhabitants per year  . Peptic ulcer represents the most common cause of UGIB and dual therapy seems to be the best treatment . Chronic ulcerated lesions have a greater chance of severe bleeding and may lead to shock within a few minutes   . 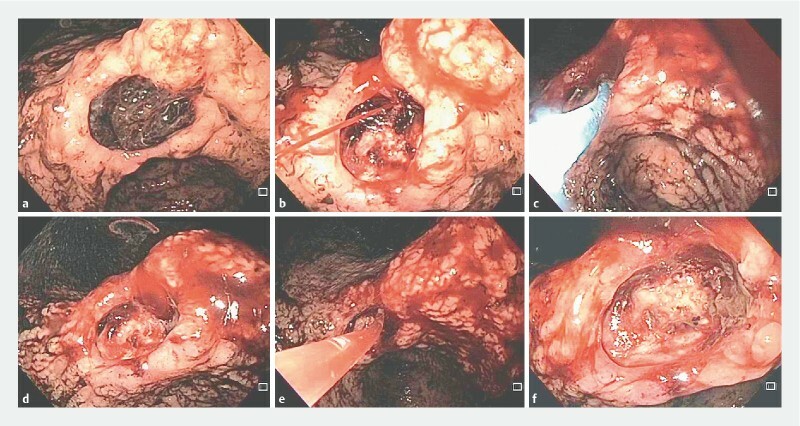 Often, owing to lesion size and the presence of fibrosis, the use of endoscopic clips is not possible and other methods are necessary for dual treatment. To illustrate this, we describe the case of a patient with UGIB caused by a chronic peptic ulcer with active bleeding, which re-bled just after the first endoscopic treatment. We propose a waiting period of a few minutes after achieving initial hemostasis in order to check for rebleeding, especially in cases with a high risk of rebleeding ([Video 1]). Video 1 Dual therapy with electrocoagulation and epinephrine injection was performed for active bleeding of a chronic giant peptic ulcer located in the incisura angularis. Owing to the size of the ulcer and the presence of fibrosis, endoscopic clips would not be successful. The importance of review time after the first therapy is emphasized in order to check for rebleeding. A 53-year-old white man presented to the emergency room with a 2-day history of hematemesis and melena. Upper digestive endoscopic examination showed an ulcer at the incisura angularis, measuring about 2 cm in diameter and with a large clot attached to its surface ([Fig. 1 a]). The clot was successfully removed with a cold snare, revealing a vascular stump with active bleeding (Forrest IA) ([Fig. 1 b]). Owing to the size of the ulcer and the local intense fibrosis, the use of clips was not possible. Therefore, electrocoagulation with a bipolar catheter was performed. Hemostasis was achieved ([Fig. 1 c]) for about 1 minute before the spurting bleeding restarted ([Fig. 1 d]). Epinephrine injection (1 mg : 9 mL) into the four quadrants was then performed, with definitive hemostasis ([Fig. 1 e]). At the end of the procedure, an ulcer with a deep base covered by fibrin without signs of bleeding was visualized ([Fig. 1 f]). Fig. 1 Bleeding peptic ulcer in the incisura angularis (Forrest IA). a Clot adherent to the ulcer. b Spurting hemorrhage. c Electrocoagulation in the vascular stump. d Treatment failure 1 minute later. e Injection of epinephrine into the vascular stump. f Final view of the ulcer. The patient remained hemodynamically stable with no new episodes of bleeding. He tolerated a normal diet after 48 hours of fasting and full dose proton pump inhibitors, and left hospital 3 days after the procedure. 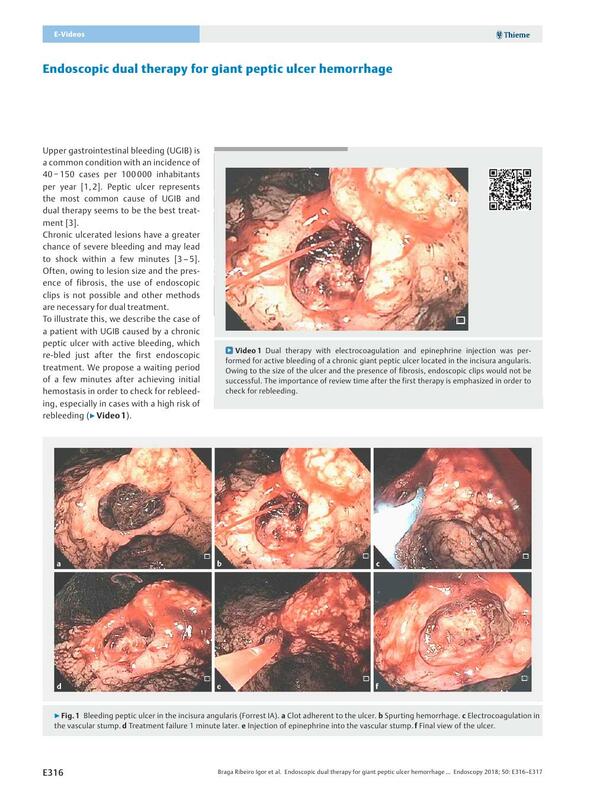 The patient underwent a new upper digestive endoscopy 6 months later, which showed healing at the ulcer site. A biopsy was performed and revealed chronic gastritis of moderate activity, and positive screening for Helicobacter pylori.